A new unique property located right at the entrance to the Gilded Mountain Subdivision. Lookout Tower is a spacious 5 bedroom 3 bath home on 4 levels - one of which is the watchtower on the 4th level. 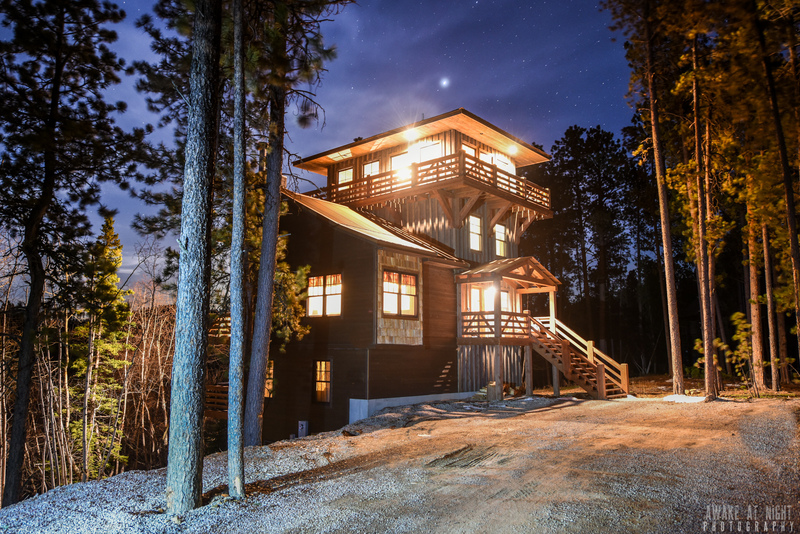 This custom cabin is wonderfully decorated with enjoyable living spaces and a one-of-a-kind master bedroom and bathroom in the top level tower room with some of the best views in the area! The main level has an open floor plan with your living room, granite kitchen, and dining area. You'll also get to enjoy a 42" TV, beautiful and cozy gas fireplace, a laundry area, and easy access to the walk out deck with Black Hills National Forest views! The lower level of the property has a wet-bar, table area to enjoy games with family, another TV and a walk out patio with a hot tub! The master bedroom is at the top of the tower on the 4th level and includes a king-size bed, flat screen TV, full bathroom and walk-out patio with endless views! On the 3rd level, there's another spacious bedroom with full-size bunk beds and small area with a TV. Main Level bedroom includes a queen bed and full bathroom. The lowest level has a 4th bedroom with twin size bunk bed and 5th bedroom that includes a queen size bed. You'll be minutes from Terry Peak and Deer Mountain, a short drive to Deadwood to enjoy the sites and some gambling, and can access the ATV and snowmobile trails right out your door at the property. Centrally located so you can enjoy everything the Northern Hills has to offer! 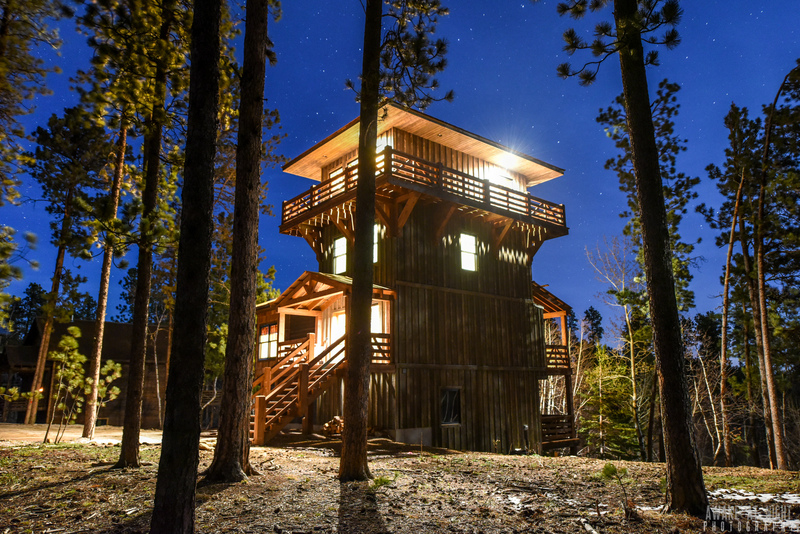 Lookout Tower is very close to our other Gilded Mountain properties (within walking distance) - Powder Ridge, Coach House, Whiskey Barrel, Claim Jumper, Stemwinder, Saloon Cabin, Lazy Bear Lodge, Copperhead Cabin and Gold Camp Lodge. So you can enjoy bringing large groups, and still have the peace of going back to separate cabins. Very well thought out layout and well stocked. Felt like I overpacked for "just in case." Thanks for your feedback Merisa! So great to see you guys had a good time and enjoyed the layout. Thanks again for staying with us - you're welcome back anytime! Thank you for your feedback Dorothy! Glad to see you enjoyed your trip and we appreciate the suggestion. Hope to see you back again soon! Wow, what a view ! Home beautiful-had everything we needed-kitchen was well stocked, house clean and comfy-just fantastic all around. Thank you for your feedback Linda! We're happy to see you you guys enjoyed the accomodations. Thanks again for staying with us - hope to see you back again soon! We had a great time, the house was clean and ready to go when we arrived. It could use a bigger TV in the living room. Thank you for your feedback Rick! Thanks again for staying with us. We hope to see you back again soon! Lookout Tower turned out to be a great cabin for our family. The rooms were well appointed and spacious. The kitchen was well equipped and we enjoyed having access to the clubhouse for a family gathering. We liked the location - a good stepping off point all the places we wanted to see: Spearfish Canyon, Custer State Park, Mount Rushmore, Rapid City and a good day trip to the Badlands. Lead has a good grocery store - and we like Redwater Kitchen in Spearfish so much that we had two meals there. Thank you for your feedback Mary Ellen! We're happy to see you guys enjoyed all the local attractions during your vacation - you guys saw a lot! Thanks again for staying with us. Hope to see you back again soon. This is our annual trip for a week somewhere in the US or Canada, this year Black Hills. Property fit our needs as we had six men. All enjoyed the property and it suited our needs perfectly. Two items, the top bedrooms need window coverings, as the morning sun came through 4:30 AM and lacking closet space. We improvised with the windows. We would stay here again if we came back. Very cool property. Thank you for your feedback Gary! We appreciate the feedback on the blinds - we'll talk with the property owner and update as needed. Thanks again for choosing us for your vacation! Very very nice house for our family of 9--spacious, lots of cooking utensils, extra comfortable beds and plenty of toiletry supplies! A definite recommendation for a big family! We appreciate your feedback Patricia! Thanks so much for leaving us a review. Great to hear you guys enjoyed Lookout Tower and that it suited your family well! Hope to see you back again soon! This was a fabulous place to stay. Spotless, quiet and in a great location. Parking is a little tight, but that was such a minimal issue compared to all the great aspects of this place. Dealing with Budi at BHAL was great. I would highly recommend this place for a relaxing get-away! Thanks so much Rodney for your feedback! It was great having you out and glad to see Lookout Tower worked out so well for you guys! Come back again soon! Take care. Thank you for such a wonderful stay, everything was perfect. Thanks so much for your review Tiffany! You're very welcome and we hope to see you back again soon! We stayed in the Lookout Tower for five days and enjoyed every minute of it. It was clean and well maintained and ideal for our family of 6 adults and two lovely granddaughters. It was convenient to most of the highlights in the Black Hills and very easy access. I would certainly recommend it to friends or relatives. Thank you for your feedback Robert! Great to see you guys enjoyed yourselves and the cabin worked out well. Thank you again for choosing us for your vacation - hope to see you back again soon! We had five couples and the place worked perfect. Very clean, great views, nice kitchen, great space for lounging. Thank you for your feedback Rick! Great to see you enjoyed the cabin. Come back and see us soon!